Terrorists of the Islamic State in Iraq and Syria (ISIS) destroyed on Thursday statue of “Allat God” in Palmyra, which is considered as one of the important historical statues that date back to the 2nd century A.D.
“ISIS terrorists have destroyed one of the most important unearthed statues in Syria in terms of quality and weight… it was discovered in 1977 and dates back to the 2nd century A.D.,” Ma’moun Abdul-Karim, Director General of Museums and Antiquities told SANA.He added the statue which depicts a lion catching a deer between its feet has been hidden in an iron box in Palmyra’s museum garden to preserve it before ISIS terrorists find it and break it into pieces.Abdul-Karim affirmed that social media websites reported that ISIS terrorists also broke 8 statues of Palmyra cemeteries which have been stolen by smugglers and taken into Manbij in Aleppo where the so-called “Sharia court” of the extremist organizations ordered to destroy. A 2,000-year-old statue of a lion outside the museum in the Syrian city of Palmyra has been destroyed by militants from the Islamic State group, according to the country’s antiquities director Maamoun Abdelkarim. Syria’s antiquities director Maamoun Abdelkarim said that Islamic State militants have destroyed a famous 2,000-year-old statue of a lion outside the museum in the Syrian city of Palmyra, a UNESCO world heritage site. The statue, which is made of limestone, dates back to the 1st century BC; it was discovered in 1977 by a Polish archaeological mission at the temple of al-Lat, a pre-Islamic Arabian goddess. “IS members on Saturday destroyed the Lion of al-Lat, which is a unique piece that is three meters (10 feet) tall and weighs 15 tons. 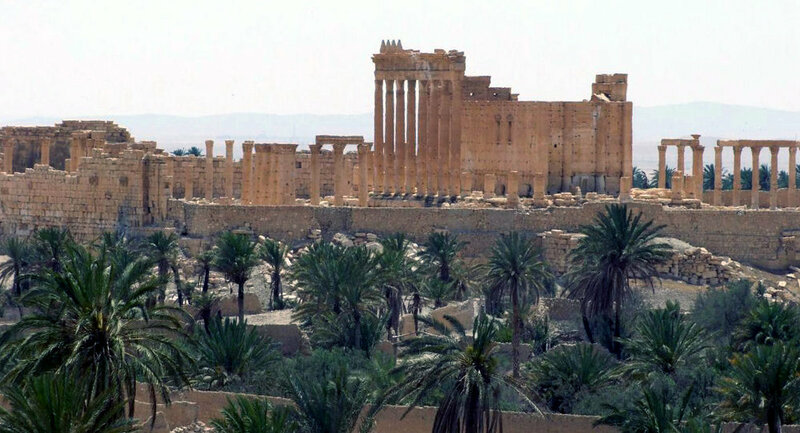 It’s the most serious crime they have committed against Palmyra’s heritage,” Abdelkarim said. He also said that the statue had been covered with a metal plate and sandbags to protect it from the fighting, adding that “we never imagined that IS would come to the town to destroy it. The Islamic State captured Palmyra from government forces on 21 May, the jihadist group subsequently blew up several historic Muslim graves. However, the most famous sites have been left intact, with most of the pieces in the Palmyra museum reportedly being evacuated by antiquities staff before the Islamic State entered the city. The lion statue destroyed by ISIL fighters in Palmyra was unique and had no copies, Syria’s antiquities director Maamoun Abdelkarim told Sputnik. In an exclusive interview to Sputnik, Syria’s antiquities director Maamoun Abdelkarim said that the destroyed Lion of al-Lat statue was unique and had no copies. 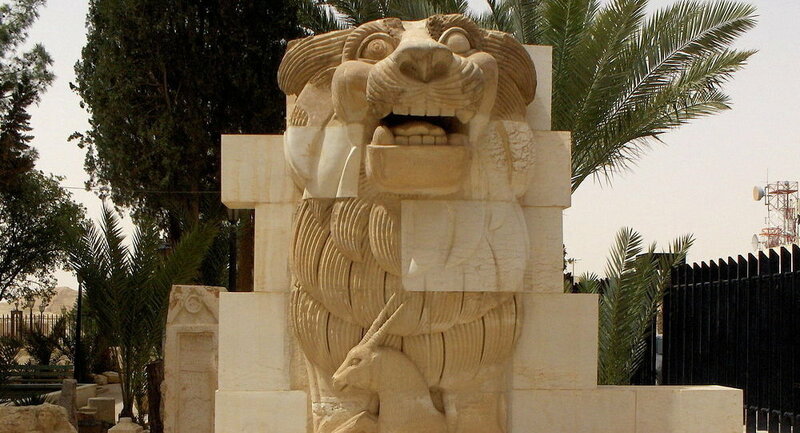 ISIL militants earlier destroyed the ancient Lion of al-Lat statue in the Syrian city of Palmyra. The fighters also looted antiquities from nearby tombs and reportedly sold them at a public auction. “The destruction of the Lion of al-Lat statue is the biggest loss for Syria’s antiquities. It weighed 15 tons and was 3.5 meters high. It was a unique artifact, the most ancient of all. Before Palmyra was captured by ISIL fighters, the statue was the first to be surrounded by metal cases, sandbags and rocks to protect it from a possible mortar attack. But we did not expect that when capturing the city, they would immediately go for the Lion of al-Lat,” Abdelkarim told Sputnik. “Yesterday, ISIL social media accounts published photographs of 80 ancient male and female busts which were looted from Palmyra’s tombs. These busts were put out to sell at a public action in the city of Manbij in northern Syria, where collectors buy them for huge sums of money. Bust and artifacts that they could not sell were barbarically destroyed, as seen in the photographs,” Abdelkarim added. ISIL militants also use explosives to destroy larger statues, as was the case in Iraq, Abdelkarim added. The looted artifacts were later sold at auction in the ISIL-controlled city of Manbij in northern Syria.